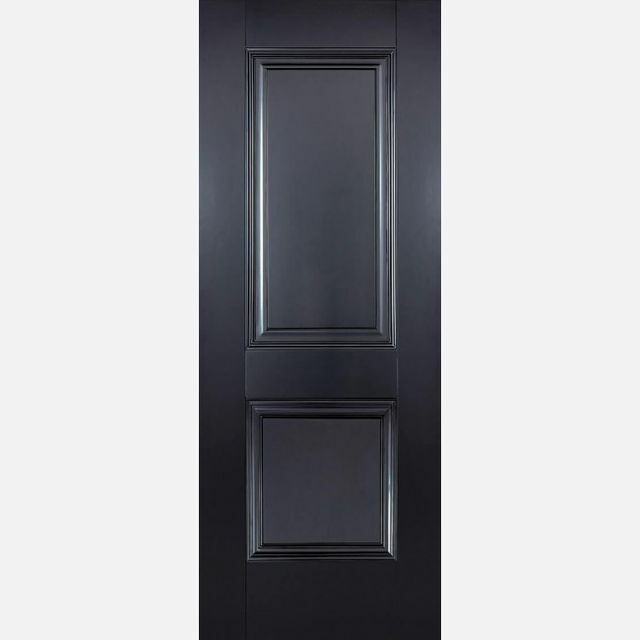 Arnhem 44mm internal black fire doors are constructed from solid engineered-timber components, to give more stability to the final door, and reduce any problems such as expansion, twist and warp, that ordinary timber components can have. Black Arnhem Fire Doors are manufactured from engineered door components which can include MDF, particle-board and laminated timber. Arnhem Fire Doors are available in Black, (Grey) and (White-Primed) to paint and Pre-finished Real-Veneer Oak. LPD Black+ Arnhem Fire Door codes - ARNBLAFC27 - ARNBLAFC30 - ARNBLAFC33 - must be treated to manufacturer's instructions. LPD Arnhem Black Primed Fire Doors have a copy of the manufacturers instructions included in the packaging. - JAS Timber cannot be held responsible for any variations in manufactured LPD ​Arnhem Black Primed Fire-Door sizes, pattern, construction, grading, moisture-content, treatment, certi­fica­tion, knots, colour or grain. - It is the purchaser's respon­sibility to check the suitability of their FD30 Arnhem Black Primed Fire Door and it's Certi­fica­tion, in conjunction with Intumescent Strip, the Fire-Door Frame with Architrave, the Fire-Door Panic Hardware and the Arnhem Black Primed+ Fire-Door's Situation of Use. - We cannot cancel or exchange LPD Fire Doors after order - LPD Arnhem Black Primed+ FD30 Fire Doors are supplied as a Special Order. Once ordered, the manufacturing process will begin, and there can be no alteration or cancellation - No alteration or cancellation will be accepted by LPD Doors Ltd.
E. & O.E. see T&C - We do try to keep prices and specifi­cations of LPD Arnhem FD30 Black Fire Doors correct, but mistakes can be made!